A heart-healthy eating plan, called the Mediterranean diet might be the right diet for you. This diet is based on the traditional foods eaten by people living in the Mediterranean region especially in Greece. 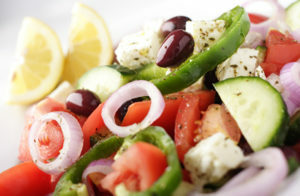 The Mediterranean diet is a delicious and healthy way to eat. It incorporates the basics of healthy eating and is low in saturated fat, very high in fiber and antioxidants from vegetables, legumes and nuts. Very little red meat is eaten in this diet and milk consumption is limited as well, except for some cheese and yogurt. Research has shown that the traditional Mediterranean diet reduces the risk of heart disease and may be associated with a reduced risk of overall and cardiovascular mortality, a reduced incidence of cancer and cancer mortality, and a reduced incidence of Parkinson’s and Alzheimer’s diseases. Eating whole grains, mostly in bread and cereal rather than pasta. Eat your veggies and fruits — and use whole grains. An abundance and variety of plant foods should make up the majority of your meals. No processed foods and purchase produce that is in season. Strive for seven to 10 servings a day of veggies and fruits. Switch to whole-grain bread and cereal; eat whole-grain rice and pasta products. Keep baby carrots, apples and bananas on hand for quick, satisfying snacks. Eat fruit salads. Nuts and more nuts. Keep almonds, cashews, pistachios and walnuts on hand for a quick snack. Choose natural peanut butter, or nut butters. Use hummus or tahini as a dip or spread for bread or crackers. No butter. Try olive or canola oil as a healthy replacement for butter or margarine. Use it in cooking. Dip bread in flavored olive oil. Spice it up. Herbs and spices make food delicious without the salt. Try garlic, basil, cinnamon, ginger, paprika, bay leaves, and rosemary. Watch the red meat. Substitute fish and poultry for red meat. When eaten, eat lean and keep portions small (about the size of a deck of cards). Also avoid processed meats like sausage, bacon and other high-fat meats. Go fish. Eat fish once or twice a week. Fresh or water-packed tuna, salmon, trout, mackerel and herring are great choices. Avoid fried fish, unless it’s sautéed in a small amount of canola oil or olive oil. Grill your fish.